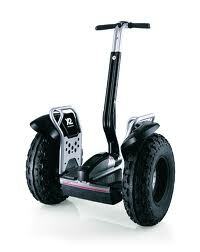 This year’s summer holiday in Florida allowed me to hire an off-road Segway. This futuristic two wheel electric bicycle balances itself so that no forward motion is needed to balance it. This highly manoeuvrable machine has a fair turn of speed and an astonishing ability to climb slopes. I could not find any terrain which it would not tackle. If the price was not so astonishingly high, these adaptable machines would be in everyone’s garage.